As we mentioned earlier this month, the church of San Pietro in Ciel d’Oro in the Italian city of Pavia, which houses the relics of St Augustine, also has those of another Saint, the philosopher and theologian Boethius, whose feast is kept today. The first page of a later 14th-century manuscript of Boethius’ Consolation of Philosophy, showing him as a teacher of philosophy above, and in prison below. His full name was Anicius Manlius Severinus Boethius; the gens Anicia were a very prominent family in ancient Rome, and there is reason to believe that St Gregory the Great was also descended from it. Boethius was born about 480 A.D., and orphaned in youth; his guardian was a member of another very ancient family, one Quintus Aurelius Symmachus, whose daughter Rusticiana he eventually married. (The Vesper hymn of Ss Peter and Paul was long falsely attributed to a non-existent second wife of his called Elpis.) His life was dedicated to the study of both philosophy and theology, and it was largely through his work as a translator that the early Middle Ages knew what it knew of the writings of Plato and Aristotle, as well as Euclid, Archimedes and others. Several of his theological treatises also survive; there is also a famous letter to him from the writer Cassiodorus in which he asks Boethius to make a sundial and waterclock for the king of the Burgundians. In the great tradition of the ancient families to which they belonged, Boethius, like his father and father-in-law before him, took an active part in the public life of Italy. By the end of the 5th century, the last Roman Emperor in the West had been removed, and the peninsula was nominally ruled by the Eastern Emperor in Byzantium, but in fact, by the Ostrogothic king Theoderic. Boethius served under Theoderic as the Roman consul in the year 510 A.D., and saw the same ancient honor vested upon his two sons twelve years later. (The fact that they were in their teens shows what the office had been reduced to in reality, but the prestige of it was still very great.) More importantly, he also held the position of the “magister officiorum – the master of the offices,” one of the greatest significance and responsibility. Shortly thereafter, Theodoric had come to believe that members of the senate in Rome were plotting with the Emperor to overthrow his kingdom and restore direct control of Italy to Byzantium. When one of their number was charged with this conspiracy, Boethius defended him in court, for which he was also accused of the conspiracy, arrested, imprisoned at Pavia, and condemned to death. During his imprisonment of about nine months, he wrote his most famous work, The Consolation of Philosophy, a lengthy dialogue between himself and Philosophy, in which she consoles him for his misfortunates, and teaches him to regard them with what, largely because of this work, we would now call a “philophical approach.” This exhortation to regard all earthly things as transitory, to value the eternal things which only the mind can apprehend, and to see the world governed by divine wisdom which is always just, was one of the most popular books in the Middle Ages, and many vernacular translation were made of it. Boethius was murdered in prison in 524, his death preceded by torture, according to the common tradition. His relics were at first buried in the cathedral of Pavia, but later move to the crypt of St Pietro in Ciel d’Oro. Although his death was essentially a political matter and not inflicted for the Faith, he was popularly venerated as a martyr, since he was unjustly put to death by an Arian heretic. In this sense, he is very similar to the 11th century Princes of the Rus’ Saints Boris and Gleb, also killed for political reasons, but immediately venerated as Saints for their Christ-like acceptance of the injustice inflicted upon them. 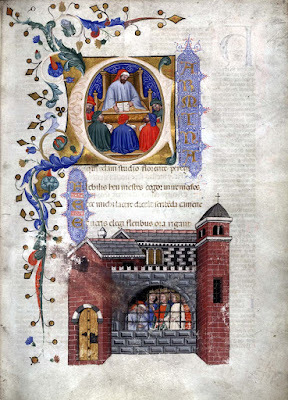 The devotion to Boethius as a saint and martyr is still kept in the city of Pavia, and also in the Roman church of Santa Maria in Campitelli, which was founded by his sister-in-law, St Galla. This devotion was confirmed by Pope Leo XIII in 1883. These photos were also taken by Nicola de’ Grandi during a recent visit to Pavia. The entrance to the crypt, under the main sanctuary. Next to his relics and altar in the crypt is this well whose water is said to have healing properties. Magnus et omnimodo mirificandus homo. Huncque Sophia suis prae cunctis compsit alumpnis. Quam sibi grande decus contulit ipse Deus! Sparsa per Europam vulgant sua dogmata totam. Et nos informat musica quae resonat. Post ictus gladio exiit e medio. A great man, in every way to be marvelled at. How great a glory did God Himself bestow (upon him). Prominent in Rome, an example of decorum. Which he clearly explained in two commentaries. And teaches us how to play music. Afterwards, the blow of a sword took him away.